Last week, whilst trawling our local antique (and junk) shops, Jem came across this funky little camera, which he promptly bought for a fiver (“Well… it would have been rude not to!”) and which I promptly fell in love with. My instant love-affair with it meant he gifted it straight to me. Yesterday I loaded it up with expired Ilford XP2 film, which is our usual M.O. if we aren’t yet sure if a camera works properly or not, and off we went to try out our very old cameras: Jem was using his Box Brownie for the first time. This little gem was made between 1946 and 1949. 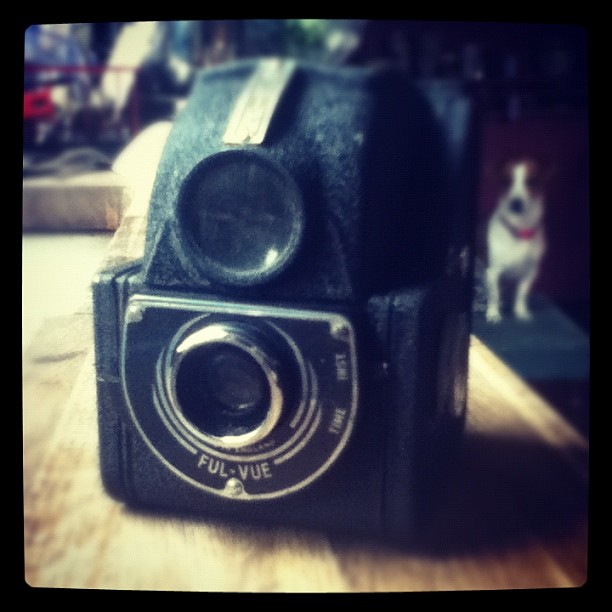 It is a TLR with a beautiful big Brilliant-style reflex viewfinder on the top. It is a unique thing – pretty avant-garde for its time – as it was the first ‘streamlined’ box-style camera of its type. It has a fixed shutter of 1/30th of a second and a fixed aperture of f11. Rather charmingly, if you pull the tiny lens out a little way, you can take close-ups of 3-9 feet, and push it back in for 9 feet or more. My first hurdle, upon taking it out of my bag for the first shot, was discovering that the mirror has come loose and was rattling around inside the viewfinder compartment. Nothing I can do about that until I’ve finished the roll, so for now I have to give it a gentle shake to reposition it and take my shots *very* carefully…. Of course I can’t be entirely sure it’s back in perfect position either, so there may be some funny angles resulting from this experiment! I’m halfway through the roll, and hope to have it finished, developed and the results posted up here some time next week.